“The problem is not to make political films, but to make films politically.” Jean-Luc Godard. On 18 May Close-Up and Carroll/Fletcher present the second part of Making Films Politically?, a short season of William Raban’s films. 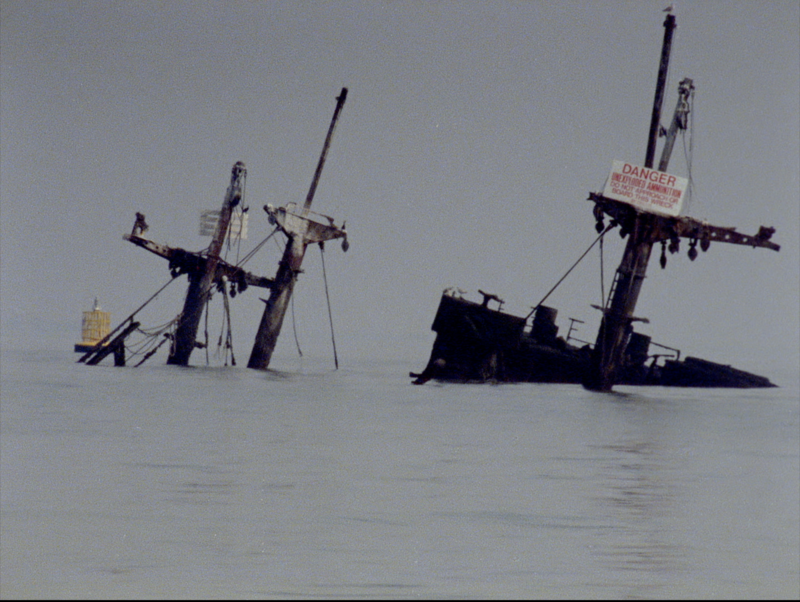 The programme features Civil Disobedience and Thames Film – two films exploring transient aspects of our natural and built environments to expose layers of historical, political and mythological meaning. The screening will be followed by a q&a with the director. Tickets are available here. 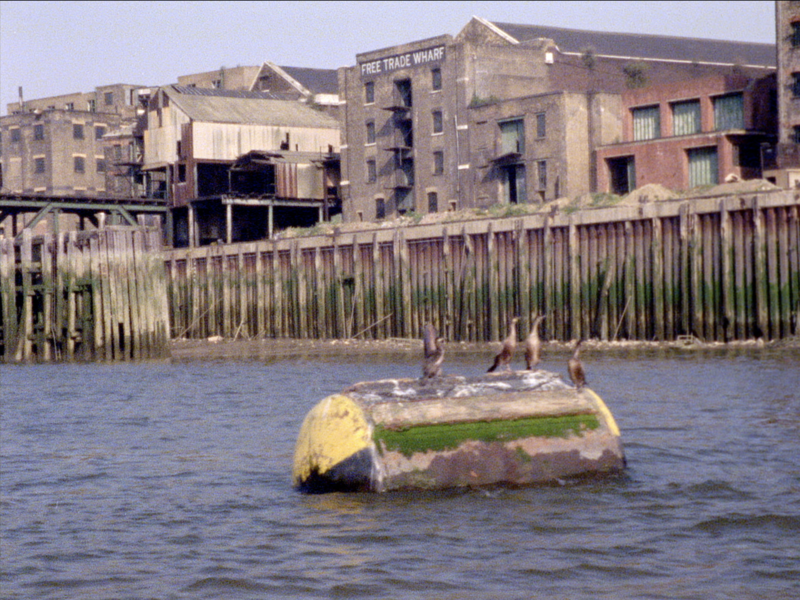 Ahead of Part Two Carroll/Fletcher Onscreen presents two films included in Part One – London Republic and Available Light – and a short episodic reflection on Thames Film. 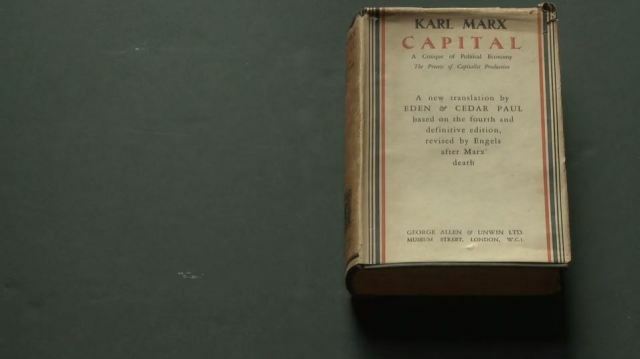 Partly as a reaction to the political climate in 2016 and partly as an exercise in film-making within strict formal constraints, in Available Light Raban filmed himself using ‘natural’ light to read Karl Marx’s Das Kapital. Shot over six days, Raban used time-lapse to compress the film to nine minutes. The images are offset by David Cunningham’s score, which is composed solely from the two words of the book’s title. “When I set out to shoot Available Light I thought the film should be 8 minutes long. I therefore timed myself reading 2 pages of the book and calculated that by filming at the time-lapse rate of 1 frame every 2 seconds, the 858 pages would last 8 minutes. I shot the film over 6 days though some days when I was going to work I only filmed for 2 hours. The ‘rule’ was simple. I set up the book under a window and only filmed in available daylight. I started reading at 07.00 when there was just sufficient light to see but not sufficient to fully expose the image on camera and continued filming until it got too dark at evening twilight to read anymore. It was February and freezing cold in my studio so I had to take regular breaks to make myself a cup of tea, have a cigarette or take a quick lunch break. At those points where I took a short break, I put a bookmark between the pages, closed the book and stopped the camera. So you can see that in the case of that film human agency impinges significantly on the pre-planned systematic structure. Also, the film ended up being 9 minutes long because I hadn’t reckoned on some passages being difficult to understand therefore taking longer to read so that is another example of human disruption to the pre-planned system.” William Raban in an interview with Federico Windhausen (courtesy of LUX, full interview here). “Another example, more minimal in its form but which recuperates time-lapse, is Available Light (2016). The proposal is simple: while natural light is available, presumably the director himself – with only his hands seen – reads from beginning to end Das Capital by Karl Marx. To this seemingly simple premise is added a fundamental soundtrack. By means of little defined noises, David Cunningham’s music turns into a sound speech and represents what could be the awareness of whoever reads this masterpiece on political economy. At first the sounds advance autonomously against the movement of the hands that turn the pages. Little by little, music and movements are mimicked, until a near complete connection is almost complete. In time, one intuits that the word is ‘capital’ that is ringing, only in fragments but each time becoming clearer, although it never quite does so completely. In short, in its entirety, it functions as a birth – a word game with the title – a political claim, a grain of sand that sets out to change the world.” William Raban Retrospectiva: Politica y Sociedad a ritmo de Time-lapse, Iago Paris, 6 June 2016. “This is a vision of the dark Thames, of ‘Old Father Thames’ as an awful god of power akin to William Blake’s Nobodaddy; and, in Blake’s poem, Jerusalem, ‘Thames is drunk with blood’. 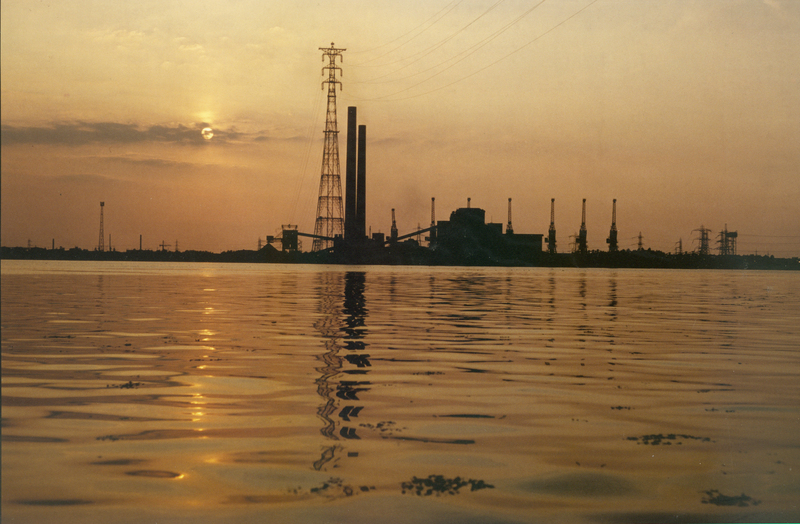 In this film there is something fearful about the river, something monstrous, recalling Conrad’s line in Heart of Darkness that ‘…this also has been one of the dark places of the earth.’ Walking along the banks of the Thames, downriver, approaching the estuary, it is possible to feel great fear. One of the possible derivations of the word Thames itself is tamasa meaning ‘dark river’; the word is pre-Celtic in origin, so we have the vision of an ancient, almost primeval, time. 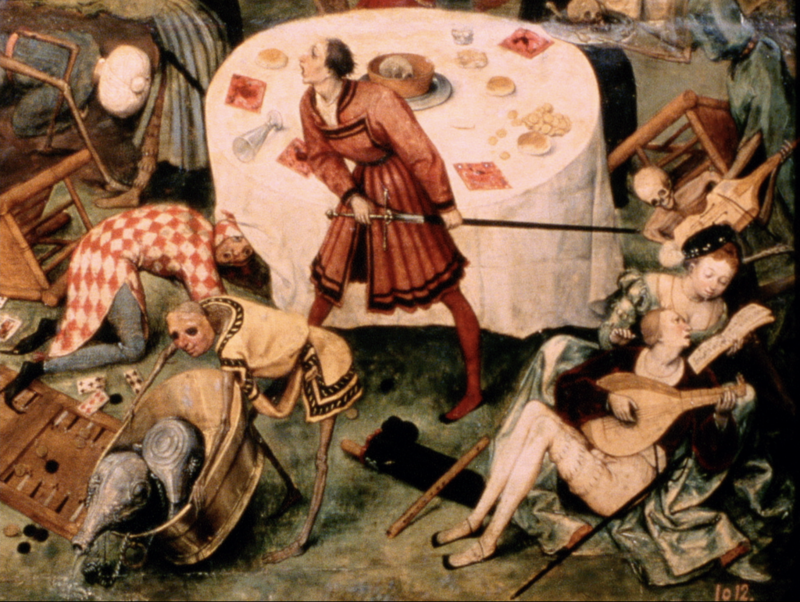 And yet there is beauty and sublimity in terror. Raban has learned something from the great artists of the river, such as Turner and Whistler, and portrayed the Thames as clothed in wonder.” Peter Ackroyd on Thames Film. By filming from the low freeboard of a small boat, Raban attempts to capture the point of view of the river itself, tracing the 50 mile journey from the heart of London to the open sea. 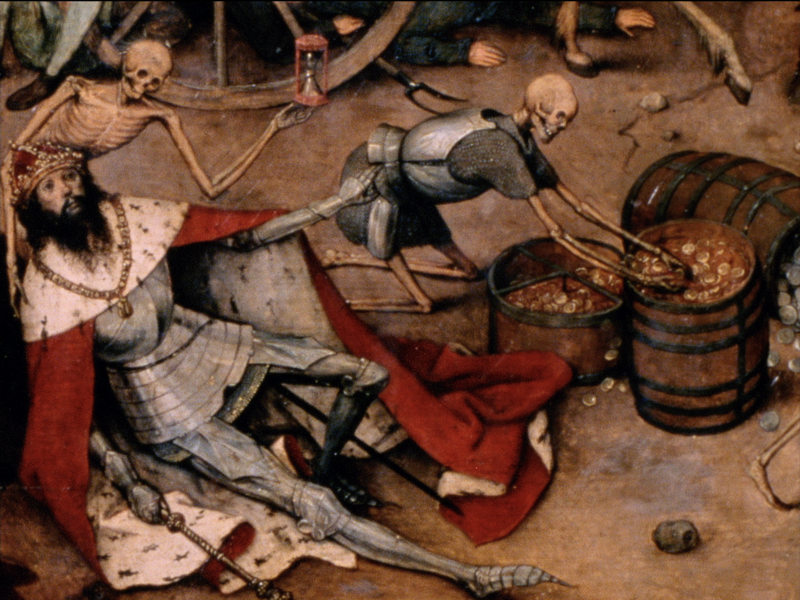 Interspersed with images from Breugel The Elder’s painting the Triumph of Death, this contemporary view is set in an historical context through use of archive film and the words of the travel writer Thomas Pennant, who followed exactly the same route in 1787. 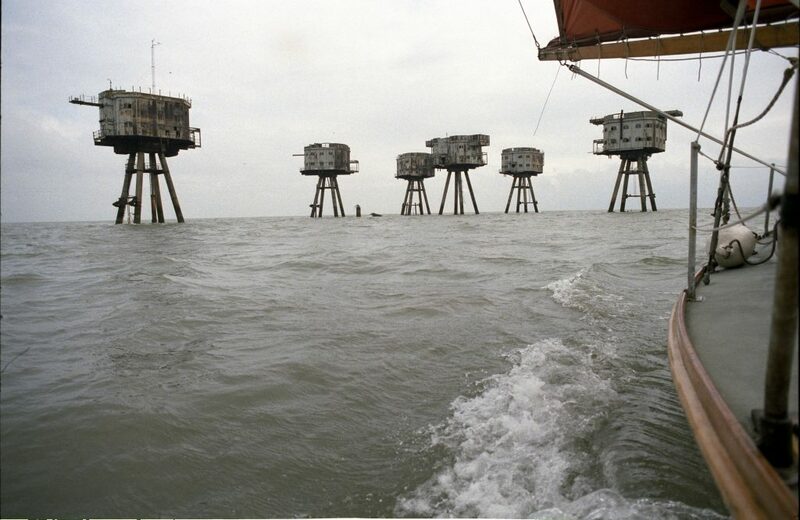 “[In Thames Film] Modernity is put on trial: Pennant’s links between British imperialism, technological advances and the Thames are juxtaposed with derelict British imperialism, technological advances and pompous voiceovers from post-war newsreels anticipating the collapse not just of the Empire but also the ideals which supported it.” Gareth Buckell, review on William Raban DVD release (BFI 2005). Is a strong brown god – sullen, untamed and intractable. “It seems to be easier for us to imagine the thoroughgoing deterioration of the earth and nature than the breakdown of late capitalism; perhaps that is due to some weakness in our imagination.” Fredric Jameson, Seeds of Time, 1994. Two reflections on Thames Film: Peter Ackroyd and Michael Chanan. Much of Raban’s interview with Jonathan P Watts discusses Thames Film. William Raban, Sequence, Winter 2012. “The notion of the ‘picturesque’ suggests landscape to me, especially when you consider ‘issues of land ownership’. I see many of my films as ‘political’ but this acknowledges the pertinent observation by Jean-Luc Godard ‘The problem is not to make political films, but to make films politically.’ I digress from landscape. I used to be irritated by the generic term ‘landscape film’. I was suspicious of where people were coming from who used it. Given that there is an accepted tradition of English landscape painting, I thought it was an attempt to legitimate film as a fine art practice. Partly with that in mind, I started making urban landscape films with Moonshine (1975) and Autumn Scenes (1978) and of course, it includes my more recent London films as well. I have always seen LS Lowry’s paintings of the industrial northeast as landscape paintings and I think there is work to be done to reclaim the term ‘landscape’ to include the city as well as so-called natural landscapes.” William Raban. ©2019 Carroll / Fletcher. Managed by Fishcakes. Powered by WordPress, Hybrid and Satu.